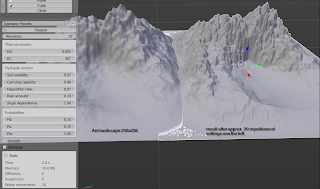 Small Blender Things: Simulating erosion in Blender part IV, addon features. Simulating erosion in Blender part IV, addon features. The result on the right was obtained by repeating the (default) settings on the left about 20 times. It is clearly visisble that gullies begin to form, some steep slopes settle at a stable angle and become wider and the central basin starts to fill with silt. After selecting the addon and again each time you click the repeat button, the selected mesh is eroded according the selected settings. Each step, all types of erosion (diffusion, avalanches and hydraulic erosion) are iterated a number of times subjected to some probability. By lowering the probabilities in the Probabilities tab certain modes of erosion can be suppressed. The statistics tab shows the actual number of iterations performed after each step. The code is available as an installable .zip file on GitHub. You can install it as a Blender addon by choosing File->User preferences->Addons->Install from file and selecting erosion.zip. Don't forget to enable the addon. The package is dependent on Numpy and having Numexpr and Psutil installed is recomended (the first for serious speedup, the latter for accurate timings, see the opening page of the erosion repository for more info). After the installation the addon is available if you select an object in the 3D View and choose Object->Erode. Note that if you have installed the erosion addon before, reinstalling it might not get rid of all files in the previous installation. You might try to restart Blender after reinstalling or, if the old version still seems to be there, get rid of the installation directory (typically Your Blender Install Dir\scripts\addons\erosion) and install from scratch. Besides commenting on this article it might be interesting to check out this BlenderArtists thread.